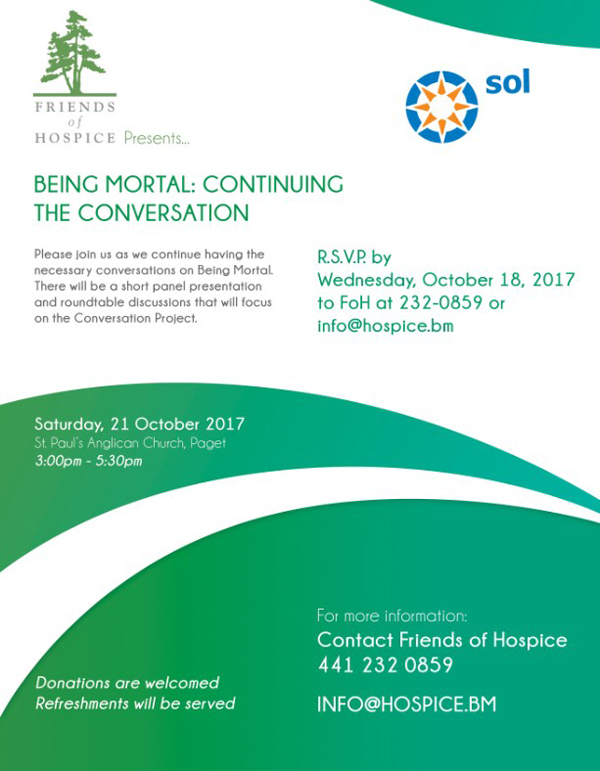 Friends of Hospice is getting set to present “Being Mortal: Continuing the Conversation on Death and Dying” on Saturday [Oct 21] from 3.00pm to 5.30pm at St. Paul’s Anglican Church in Paget. A spokesperson said, “Friends of Hospice hosted the viewing the PBS Frontline documentary – Being Mortal based on the book by the same name by Dr. Atul Gawande. This was part of our efforts in participating in World Hospice & Palliative Care week. “We appreciate the support of our efforts to make small steps towards having important conversations on end of life wishes and difficult conversations. “There were over 130 in attendance which speaks to the importance of Friends of Hospice making these opportunities available. Earlier this year, we hosted the first conversation and 100 people attended. It is evident that our community is ready to learn and discuss what they want to see at end of life and how to have conversations with loved ones in order to make wishes known. “This Saturday, October 21st, please join us at St. Paul’s Christian Education Centre in Paget from 3pm – 5.30pm for the continuing conversation — the second in the series and our final activity to close out World Hospice and Palliative Care week. When it comes to end of life care, talking matters. “There will be a panel comprised of physicians; a palliative care worker and a pastor who will make a short presentation on their experiences with families — the good — the not so good and the challenging. “There will be an opportunity to move from each circle of topics based on The Conversation project to provide individuals with information and tools to start a conversation. “The activities are based on the questions in the Institute for Healthcare – Your Conversation Starting Kit and we will provide guidance in how to move through the challenges of starting a conversation in order to avoid the difficult decisions and family conflict that end of life brings when we aren’t prepared.